Arden are once again dabbling in the world of experimental (and this one really is mental) mounts as they try to find a way to finally defeat the Highlanders at the third time of asking! Arden do not lack top class players. They have two members of the UK’s Men’s squad (Hamish and Jason), the excellent UK ladies player, Miss Sophie Loddder, and the UK’s coach, Greg Sargeant. They also have two of the UK’s most promising youngsters, Dan Duhig and Jono Keen. They did lose Alex Bull to the Highlanders in the off season, which is a blow but not one that will worry them unduly, they have other players who can play A grade, such as Chris James and maybe Suzanne Sargeant, if she returns from Africa this year. Therefore, it would seem they really lack horse power and it is this they are trying to remedy with this latest addition. 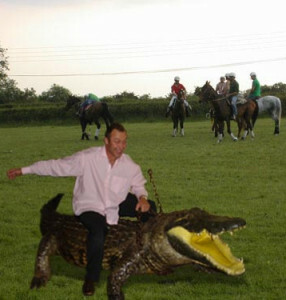 An Arden insider told us that the last experiment, which was reported exclusively by Polo-X-treme and involved Jono Keen riding a donkey, didn’t quite go as well as they hoped but they hope Greg Sargeant’s new mount will have more bite in it and be better at (death) roll backs! Other teams are looking at more orthodox ways to try and defeat the Highlanders. Both Kent Target and Welsh Dragons are looking to bring in two top foreign A graders in the off season. It is not known who will be in the Highlanders team this year but Bully would seem to be a straight swap for the UK Ladies captain, Shelley King, who has left the Highlanders after two seasons to go back to her old club Pendle and play alongside Debbie Harris and Kerry Bean.